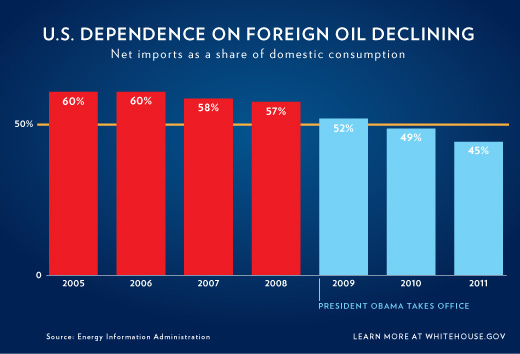 The White House used this chart to argue that their efforts have helped decrease foreign energy consumption. During a visit to Nashua Community College in New Hampshire today, President Obama used visual aids to make a point about the progress his administration has made on the quest for energy independence. Tom Cohen over at CNN Wires has a good write-up of the president's remarks, and check out the chart above that he showed during his speech. (CNN) - A day after Republicans signaled possible compromise with the White House on energy issues, President Barack Obama called Thursday for Congress to vote in the coming weeks on ending billions of dollars in subsidies for the oil industry. "Eliminate this oil industry giveaway right away. I want them to vote on this in the next few weeks," Obama told students at Nashua Community College in New Hampshire. "Let's put every single member of Congress on record: You can stand with oil companies, or you can stand with the American people. You can keep subsidizing a fossil fuel that's been getting taxpayer dollars for a century, or you can place your bets on a clean energy future." Framing the issue as a major challenge for the students' generation, Obama said developing a broad-based energy policy incorporating all sources - oil, gas, nuclear, solar, wind and alternatives such as algae - would take years but was essential for the nation's future economic well-being. His speech came as gas prices continued to soar around the nation, prompting criticism from Republicans that Obama's policies failed to fully exploit U.S. resources that would help bring down energy costs. Senate Republican leader Mitch McConnell of Kentucky rejected Obama's call to end the oil subsidies. Yes of course. And while you are about it eliminate Medicare, Medicaid and Obama Care. What's fair is fair. The reason Obama is ignoring the wisdom of Bill Clinton, regarding the pipeline, is because all Obama cares about is shifting Billions of dollars, to the Green companies, so that they will contribute to his reelection campaign. call on all you want obama...you hung your credibility at the door when you took office...no one is going to play ball with you...go home...to the rat hole you crawled out of. This was said by obama so i strongly disagree with what he said. Hes an evil Conservitive and deserves to be charged with treason.... Now if a republican said this i would be all for it. I see what you did there, and I approve. Congress – rewrite the bill to include ALL subsidies then pass it. Sorry John. That will never happen. Welfare and "green" giveaways are protected and are therefore exempt! The wagons have been circled so hard the horses are dizzy! Our resident president is an idiot. He so does not understand the energy needs of our country. He was quoted as saying he wanted gas prices to get to 10-12 dollars a gallon to force people to alternative energy. He's getting what he wants. But it's ok for Obama to throw $7 billion at green companies that either go bankrupt or keep laying off employess. The existance of federal and state taxes added into gas prices is not the fault of big oil. You keep "repo" this and "repo" that! Is there not ONE Dem who has ties to big oil it ties to oil, NOT ONE? Perhaps they are all lined up to cash in on "green" and failing subsidies? Perhaps it does make sense to ween oil off of government funding. Just don't expect "green" to come to the rescue! BTW don't get surprised when gas prices hit European levels! But that appears to be the plan all along, right? There is no infinite amount of oil in this world. Like it or not, we will have to rely on something else eventually. And not everyone is perfect. Im sure there are some bad democrats out there as well. Stop looking at the world in black and white, and realize that not one person represents all. Oh I know oil is not finite! My problem is no having to reply on another source. My problem is government interference in picking winners and losers in that other source (Solyndra for example and the others "suddenly" went bankrupt after recieving government funding). As for your admonition to "stop looking at the world in black and white and realize that not on person represents all". That is actually good advice! You plan on sharing that with your cohorts on the left, SOME who feel the need to toss out blanket statements? That would be good! I thought we Americans were getting smarter. However, the majority of these comments are the total opposite. – BIG OIL is fighting any and all alternative energy because it cut's into their nickle. – Fossil fuels will be the death of us in more ways than one. Primary, the enviorment. – Don't transport that dirty tar sand crap through the heart lands. Also, it takes more energy and resources to produce. Not to ignore the processing bi-product contamination. BTW...when the tar sands are going to be refined by BIG OIL and eventually sold on the open market for (drum roll....) more profit, and it won't effect OPEC prices. – Natural gas, bountiful but, the fracking bi-product contamination of aqufiers will destroy regional natural drinking water. – Why not have a green energy market, and let someone else play/make money, Oh I forgot. BIG OIL greed doesn"t want to share. Enough of my rant for today. But America, most of us are highly educated, owe too much on student loans, have childrens furture's at stake, to surcome to ignorance. Let's do our research before making unsubstantiated comments. BTW...politics with their special interest is driving the negative rhetoric. WE ALL KNOW... George W. was on a sinking ship, and he knew it. He tossed his boys on Wall Street a life line, and to cover his a$$ and investments. Now everyone's piling on president Obama as if he ws the root cause of why we are where we are today. We all should be insulted that congress is making any positive attempt to marginal solvency so difficult for our president. They think we're ignorant...!